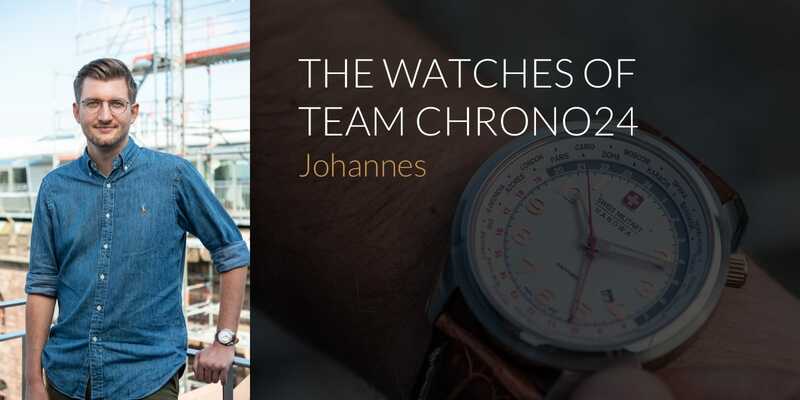 The “Watches of Team Chrono24” series gives us the opportunity to share our watches, their corresponding stories, and our passion with you. I’m wearing a Swiss Military Hanowa Worldtimer. Why did you choose this watch? Two Christmases ago, I wanted to gift myself a new watch and discovered this model after a bit of searching. I generally find world time watches both attractive and technically fascinating. I like this watch, in particular, because it has a nice weight and is comfortable to wear. When I tried it on, I knew I wanted it straight away. What have you experienced with this watch? Since I wore this watch nearly every day in the beginning, I’ve experienced everyday life as well as special occasions with it on my wrist. For example, I wore it during the entire interview process at Chrono24 – it seems to have brought me good luck. What fascinates you about watches in general? There are so many watches that have their own stories; either a story to do with their brand, model, or the watch itself. I think the connection between the Omega Speedmaster and the Moon landing is the most famous story out there, but a watch can also carry a personal story from the past of an individual or entire family. There’s so much more to watches than just sophisticated engineering and mechanics or even material value – I think that’s great. What is your “grail” watch? That would definitely be a Rolex Explorer I. I really like how it looks, especially the design of the hour hand. I also find the adventurous stories associated with the watch interesting – particularly the first Mount Everest ascent. What watch would you like to buy next? The Longines HydroConquest Automatic – I’d like to gift myself this watch as a reward for making it through my probationary period at Chrono24. I also like Oris and Junghans watches, but I’m looking to add a diving watch to my collection. What other watches will you find at Chrono24? Discover them all in the complete Team Chrono24 Watch Collection.